Leading British ventilation manufacturer Vent-Axia is delighted to announce that the Floating Home project has been shortlisted in the Building Awards 2018. The project, which utilised the revolutionary Lo-Carbon Sentinel Kinetic BH Mechanical Ventilation with Heat Recovery (MVHR), is a finalist in the ‘Small Project of Year (up to £5m)’ category of these prestigious awards. The Building Awards are the industry’s longest running and most prestigious recognition of excellence, and celebrates the achievements across all aspects of building. Winners will be announced at a ceremony on Tuesday 6th November at the 5* Grosvenor House Hotel in London where over 1,300 guests will attend for a night of networking, recognition and celebration at this important gathering for the UK construction sector. 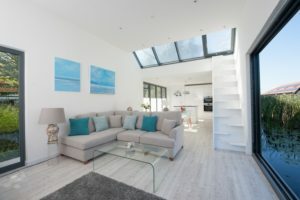 Vent-Axia’s Sentinel Kinetic BH MVHR unit is providing energy efficient and effective ventilation to the innovative and exciting ‘Floating Home’ project which is situated on a residential mooring near Chichester Marina in West Sussex. 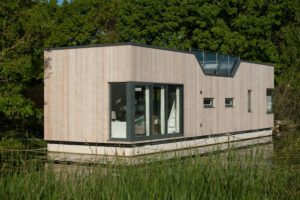 Inspired by canal living and designed by Baca Architects, the ‘Chichester’ prototype model was built by Floating Homes Limited and is not a houseboat but a house that floats. Given the close proximity to water there was potential for more humidity than a land-based home, as well as the potential for reflections of the sun to enhance solar gain. Both these factors were considerations when specifying the Sentinel Kinetic BH MHVR unit, which tackles both these issues thanks to an integral humidity sensor and summer bypass. For further information on all products and services offered by Vent-Axia telephone 0844 856 0590 or visit www.vent-axia.com. For further details on the awards, visit www.building-awards.com.